Celebrating Mass with archbishops from 25 countries, Pope Benedict XVI reflected on his 60 years as a priest, calling it a demanding and “awe-inspiring” ministry that brought him closer to God. The Pope’s unusually personal recollection came on the anniversary of his priestly ordination in Bavaria in 1951 and the feast of Ss Peter and Paul, the patron saints of Rome. 3 years ago an ancient inscribed sarcophagus was turned over to the Theft Prevention Unit of the Antiquities Authority. It was discovered by grave robbers who plundered and ancient Jewish tomb site, from the period of the second temple. The sarcophagus probably came from a burial cave in the area of the Elah valley, on the Yehuda plains. Scientists from the antiquities authority determined that the sarcophagus was for bone interment, a practice common from the first century BCE to the second century CE. The front of the sarcophagus bears the aramaic inscription “Miriam, daughter of Yeshua, son of Kipa, priest of Ma’azyah from the house of Imri”. One of the family members, the High Priest Yehosef Ben Kipa was famous for his involvement in the trial and crucifixion of Jesus. Ma’azyah was the name of the 24th priestly service shift at the temple. Members of this family signed the convention mentioned in the book of Nehemiah (10,9). The House of Imri refers to the priestly family of Miriam, or to the location she came from. The authenticity of the sarcophagus and inscription were verified using the technology called ESEM/EDS (Environmental Scanning Electron Microscope / Energy-Dispersive Spectrometer). Caiaphas was the High Priest at Jesus’ trial (Matt 26:57-68). The Israel Antiquities Authority says the ossuary was seized from tomb robbers three years ago and has since been undergoing analysis. 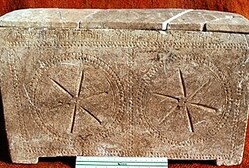 Forgery is common in the world of biblical artefacts. Israeli scholars have confirmed the authenticity of a 2,000-year-old burial box that appears to bear the name of a relative of the high priest Caiaphas mentioned in the New Testament, the Israel Antiquities Authority said Wednesday. The ossuary was seized from tomb robbers three years ago, the government antiquities body said in a statement. Because it “was not found in a controlled archaeological excavation and because of its special scientific importance,” the statement said, it has been undergoing lab tests since then. A similar ossuary — bearing the inscription “James son of Joseph brother of Jesus” — is currently at the center of a fraud trial under way in Israel. The word “maaziah” on the inscription refers to a subset of the priestly caste. Scholars believe “Beth Imri” refers either to a priestly family or to the family’s village of origin. The restoration of a tomb in the catacombs of St. Gennaro in Naples, revealed a new discovery. 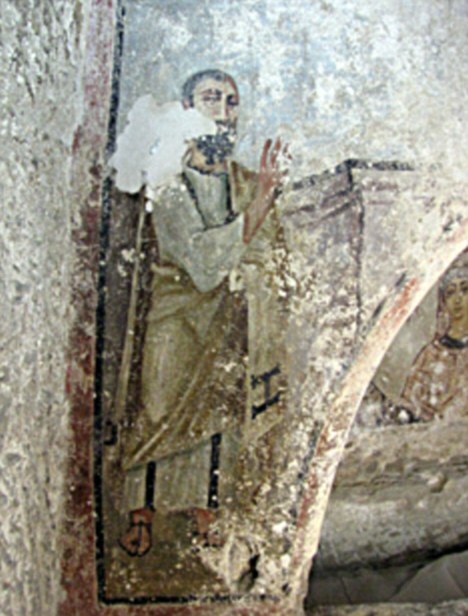 The image of St. Paul was found, painted in the grotto. It shows the disciple turning toward the deceased, with an expressive face, seemingly honoring the person. Expert say the image is from the first years of the 6th century. One of the oldest images, before St. Paul became an icon of the Byzantine civilization. The earliest image of St. Paul is from the 4th century. It was found in the Roman catacomb of St.Tecla. The painting was found during restoration work at the Catacombs of San Gennaro (Saint Januarius) in the port city of Naples. News of the discovery was announced on the feast day of St Peter and Paul which is traditionally a bank holiday in Rome. The figure of Paul is dressed in white and beige robes with the letter ‘I’ on the hem, which may stand for ‘Iesus’ (Latin for Jesus). He is seen approaching a dead person. Details on the right hand side of the fresco have crumbled away but nevertheless it still remains a striking image. Comment: We would probably go to confession to Peter sooner than to any of the other apostles. He is perhaps a more striking example of the simple fact of holiness. Jesus says to us as he said, in effect, to Peter: “It is not you who have chosen me, but I who have chosen you. Peter, it is not human wisdom that makes it possible for you to believe, but my Father’s revelation. I, not you, build my Church.” Paul’s experience of the risen Jesus on the road to Damascus was the driving force that made him one of the most zealous, dynamic and courageous ambassadors of Christ the Church has ever had. But persecution, humiliation and weakness became his day-by-day carrying of the cross, material for further transformation. The dying Christ was in him; the living Christ was his life.